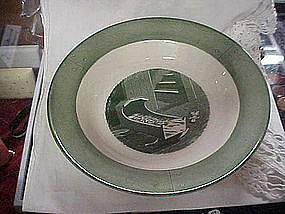 Nice large rimmed soup bowls in the Colonial Homestead pattern by Royal china. Classic green and white with the cradle design in the center. These bowls measure 8 3/8" in diameter and are in perfect condition. There are only 2 available. Check the catalog for other pieces in this pattern. Price is for each bowl.